Arriving in Lanzarote for a family holiday, I expected a relaxing beach holiday – not the wealth of delicious food, fabulous eco accommodation and stunning scenery that we discovered there. Trekking around the volcanoes on the outskirts of Timanfaya National Park in Lanzarote has to be one of the best experiences of my life. We stand at the beginning of time, biologically speaking. The land is covered in a fine dusting of lichens and little else. It is as if plantlife were just starting to colonise the earth. Black volcanic rocks, like massive cornflakes, stretch for as far as the eye can see, encircled by rising volcanic peaks. However, some wild tobacco and thorns are started to populate and lizards dart in and out of the crevices. Our guide, José Luis of Blackstone Treks leads us through a lesson in evolution and geology that puts anything we learned in school to shame. He explains that many rabbits live amongst the lava and points out the evidence, tracks on the side of the volcano that lead from plant to plant. We hike up to the rim of one of the larger volcanoes, the morning sun on our backs. Each step is accompanied by a new fascinating fact from our volcanist/naturalist guide. When we reach the summit we almost fall into the crater in awe. This is a family tour for my partner, Jez and I and our two home educated daughters, Jasmine, 13 and Daisy, 11. It is probably the most awesome geography lesson ever taught. We get to peer into lava bubbles, slip inside a tunnel made from cooled lava and admire carefully tended fig trees that thrive in the volcanic soil. In fact, the ash from the explosive mountains provides a miraculous solution for growing plants on this windswept, sunbaked isle. Exploring the island we come across terraces of vines hanging with tiny grapes, huge allium heads and many fig trees. The volcanic ash works to collect water at night and prevent it evaporating in the heat of the day. Hence the rich variety of vegetables and fruit that can be grown in parts of the island. 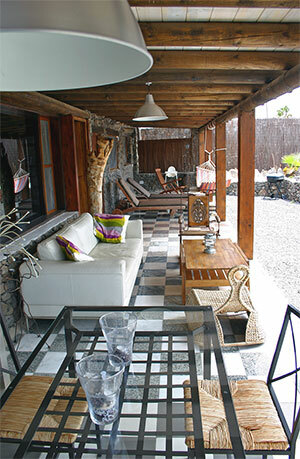 A selection of huge, succulent produce greets us on arrival at Lanzarote Retreats, where we are staying, in the north of the island, a relaxed paradise for families, where you can truly get away from it all. Our stay really begins as we are greeted at the airport by our effervescent host, Tila Braddock. He has come armed with a bottle of fizz to aid our relaxation into the retreat and island life. As he drives us to the Finca de Arrieta he gives us a potted history of the island and how he came to be here. He created the Finca de Arrieta in 2007, along with wife, Michelle, and their four children. Originally the family lived on site amongst the yurts and other eco accommodation at the retreat but they now live a short distance away and have a passionate team working for them to provide guests with a real sense of nurture. Tila and Michelle have combined their strong environmental ethics, great business sense and creativity to manifest accommodation that is really special. Each yurt, lodge or barn is quite unique and each is completely off grid; solar and wind energy are used to power the whole site. This is just the start though; there are many green initiatives implemented here. From the chickens that eat the scraps and provide residents with free eggs to the careful conservation of water to the hybrid vehicles included in the rental of many of the properties. Having a large family themselves, the couple are well aware of what makes a holiday relaxing for parents. They have thought of everything and provided it in a way that doesn’t detract from the gorgeous boho chic feel. There are highchairs, travel cots, toys and games tucked unobtrusively into each residence. The communal area has two pools, one suitable for babies and a huge Vietnamese style covered daybed, affording much needed shade in the heat of the day, big enough for two families at siesta time. 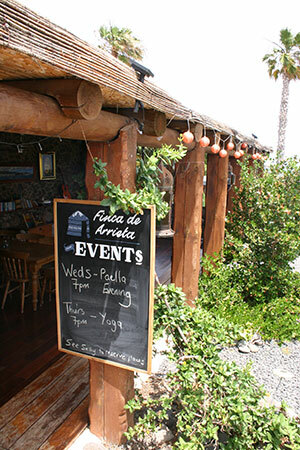 The communal fridge houses chilled drinks and fabulous deli snacks from Browns Deli in Costa Teguise. Arrieta itself is a quiet fishing village, which nonetheless boasts a great selection of restaurants mostly serving traditional Canarian delicacies; grilled squid, garlic prawns and fried peppers were some of our favourites. One night during our stay, we slipped down to the beachside restaurant for a meal after a relaxing yoga class at the Finca. We watched the sun setting behind the volcanoes and drank chilled Lanzarotean wine from large glasses, feeling just about as blessed as can be. Another gastronomic highlight was a meal with the inspirational founder of the Finca, Michelle. She lead us through the local handicrafts market in Haria to the Teleclub, a sort of souped-up village hall. Although residents can take free yoga, sewing and tai chi classes here, it also boasts a great value restaurant and wine bar. We ate tapas style, sharing plates of chickpea stew, calamares, local cheeses and more. The food and service was down to earth and traditional. Of course another draw to the island is the work of César Manrique, who was responsible for creating some of the finest spacial art experiences in the world. 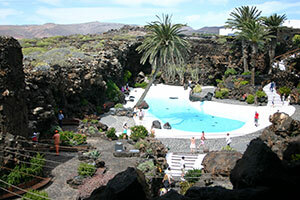 The first site we visited was the Jameos del Agua (pictured), just a short drive from where we were staying. I actually welled up with emotion as we stepped into these caves created by lava bubbles. The sight of the lush greenery and the sound of the myriad birds nesting there and the music chosen by Manrique were quite powerful. Later in the week we visited his home and studio and explored the underground rooms created by bubbles in the lava. Many of his paintings and sculptures are housed here, along with other modern art by Picasso and Miro. I fell in love with the vistas created by the huge picture window looking out over the volcanic scenery. One super hot day we took a trip in a small ferry out to neighbouring island, La Graciosa. Around 600 people live here in one village. The rest of the island is uninhabited and criss-crossed with sandy tracks. We walked out to the very tip and spent the morning in a deserted sandy cove, swimming in the sea and lying on the beach. Each and every day spent on the island blew our mind – we met some fascinating people, ate incredible food, soaked up as much sun as we possibly could and left with the resolution to come back as soon as possible. October sees vegan festivals and fares popping up all over the country. The first wave this weekend include Scottish Vegan Festival and Abundance in Manchester. Looking for the best in natural beauty? Care about how products are manufactured and the ingredients used? These retailers are some of our favourite natural beauty boutiques. Each one has hand picked brands to help you feel good from the inside out. Go cloudspotting, forage and cook watercress, celebrate St George's Day, try cloth nappies, have a legendary day out!